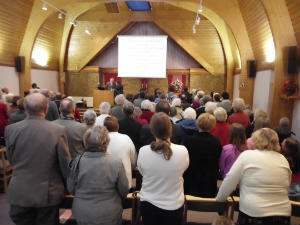 Sunday worship services are at 11.00 am and 6.30 pm. You are warmly invited to join us for worship at either of these two services. If you are visiting us for the first time please do introduce yourself to the welcome team members in the entrance foyer. We can then explain our children's groups and creche arrangements, if this would be helpful. The children and young people join in with us for the first part of the service, then go out to their own teaching groups. There is also a creche for children under three years of age. Prayer precedes the evening service at 6 pm in the church lounge. Communion is held as part of worship services on the second Sunday evening, and the fourth Sunday morning, of each month. We invite all who seek Jesus to share with us.